You ever have one of those days where you wake up, get going with doing things, then look at the clock and are like, "Whoah! It's already 7pm!! How'd that happen!?!" Yeah, that was my yesterday. I woke the same as any other day except a voice was in my head... Ok, no voices in my head, but I did get started on various things, then realized that goddamn, it was late! So you didn't get your reviews yesterday. So I'm making up for it by posting them early today. Don't worry, this won't become a regular thing. Anyway, today we have: Elder Sign: Omens of the Pharaoh, Zombicide: Green Horde, Batman: Gotham City Chronicles, Listit, Draconis Invasion, Dice Throne, Palm Island, City of Gears, Stuffed Fables, Pandemic: Rising Tide, V-Commandos: Secret Weapons, Planet of the Apes, Indian Summer, When I Dream, and Gaia Project. theMCGuiRE review takes a look at Elder Sign OMENS OF THE PHARAOH - a new expansion for the ever popular Elder Sign board game from Fantasy Flight Games. This game is really a favorite of mine and I love to see more expansions released on this platform. I feel like each time they really do a nice job with these expasions, making it not only new items to add in but a different experience to bring players back to the table - very well done done! Omens of the Pharoah offers a new experience with new characters, location cards, mechanics and epic level end game bosses! So if you are into egyption lore or Arkham Horror or an Elder Sign fan - this is a definite buy and enjoyable experience for 1-6 players. CLARIFICATION: In this video I call out there are more than 4 Dark Pharoah cards, I got confused and mistated this and it was not stated correctly and not caught in editing. There are only 4 of these cards in the expansion. theMCGuiRE review takes a look at Zombicide Green Horde - this is the kickstarter delivery and I have the epic Wave 2 still to come! This game is going to offer a very different experience in my opinion due to the movement restrictions and other new mechanics. The miniatures are amazing and they really nailed it on this version of Zombicide. One thing I want to make clear that may not be reflected or articulated properly in this video...is this is an "expansion" to Black plague and a standalone new experience. This is definitely the "next step" in the evolution to the Zombicide platform, so I do not look at this as only an expansion to Black Plague but the next version of the game. You also should not feel that you need the Black Plague content at all here. If you already have all that stuff - feel free to incorporate it in those quests but this truly is a standalone experience - and a good one. In this video, you will get an unboxing of everything, a review of the miniatures, and some of my thoughts on whats to come here. If you like Zombicide or games like Zombicide, then you will really enjoy this version. I really think they nailed it with this release and I look forward to future expansions in this line. In this video I will be taking a look at Monolith's newest Kickstarter game Batman: Gotham City Chronicles. I will be showing you some of the different features of the game including the player boards for both the hero players and the villain player. I will also be looking at combat and how some of the models look. In this video I will be taking a look at most of the differences in Monolith's new Batman game compared to their previous game Conan as both titles use the same set of rules. Stuffed Fables from Plaid Hat Games is really a thing of beauty. Since it was announced last year, I’ve been excitedly waiting for this game to hit store shelves. Because Stuffed Fables is a storybook driven game, I feel like this is a game that will grow and change as you play through the 7 chapters included in the book. I’m going to attempt to write about our experiences over a series of 3 blogs that will hopefully give you an idea if this is a good fit for your family. This series will stay away from spoilers and will include the opinions of the whole family as we play. The North Sea is angry and threatening to reclaim the Netherlands for itself. Players need to work together and build a series of dikes and wind-powered pumps to help keep the floods at bay. 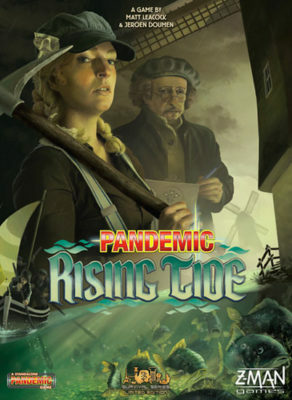 The goal in Pandemic: Rising Tide is construct four modern hydraulic structures before the waters take over the land. In typical Pandemic fashion, each player gets a unique role and a hand full of player cards. The new stuff in the Secret Weapons box is mainly more of all types of stuff. There are more tiles, more tokens, some new weapons and characters, and new missions. This is a “I like it, I need new toys!” type of expansion. Specifically, the new weapons, missions, and characters are the draw. 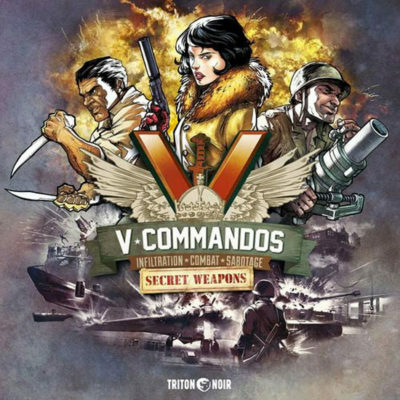 New characters include the Butcher (a silent melee combat focused character), the Intel Officer (gets a German uniform for free), and a Mortar Gunner (an explosives expert). The added weapons are a Panzerfaust (like an RPG), mortar, and smoke grenade. These have predictable effects on terrain and grant a level of flexibility in the missions that definitely skews more towards sabotage than subterfuge. 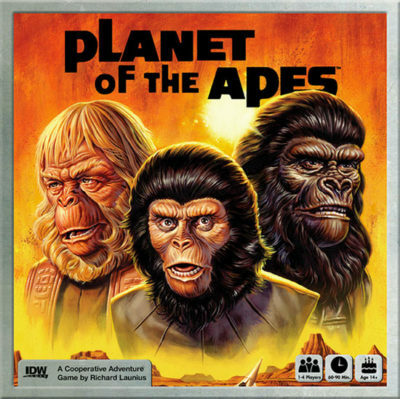 In Planet of the Apes, each player takes the reins as one of four parts of Colonel George Taylor’s psyche. As the only main human character in the original Planet of the Apes, it makes some sense that everyone has to kind of split up our protagonist. Regardless, each turn you will take up to 3 actions in an attempt to complete encounters that travel through the timeline of the film. There are 8 scenes that you play through. Three of them (the 1st, 3rd, and 5th) are minor scenes that are the same every game and just give players a simple decision to make that provides a little bonus as you go into the next major scene. 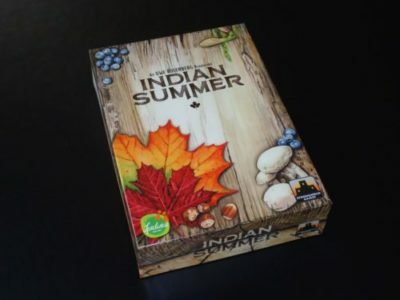 Indian Summer is a tile laying game with a racing element. You are hiking through a lovely autumn forest, encountering treasures (in the form of forest products like berries and mushrooms) and filling in your section of forest with leaves and animals. But this is no relaxing hike for daydreamers and dawdlers. This is a race to fill your section of forest first. 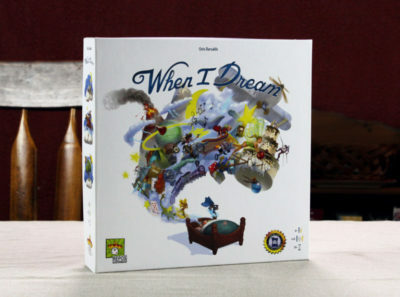 In When I Dream, players take turns as the Dreamer trying to guess as many secret dream words as they possibly can. The Dreamer wears a blindfold (or otherwise covers their eyes) while every other player offers clues, one at a time, during a 2-minute round. The players giving clues can only say one word at a time, can’t do a “rhymes with” or “sounds like” or say a word derived from the secret word. Clue-giving goes in clockwise order. The Dreamer gets one guess for each word; right or wrong, you move on to the next word. However, the dreamer can wait for as many clues as they desire before dropping their guess. 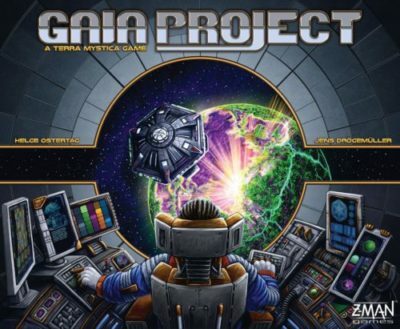 Gaia Project is a complex Euro game for two to four players. Players control unique alien races and try to colonize the galaxy with their buildings. The player with the most points wins. To begin, each player receives a unique alien race, represented by a faction board. The modular board tiles are arranged, and the technology tiles are randomly assigned to the nine spaces on the technology board. A random advanced technology is assigned to each technology track, two end-game scoring conditions are randomly chosen, one round-scoring bonus tile is randomly assigned to each round, and round boosters are randomly chosen based on the number of players. Players set their buildings on their individual faction boards, choose starting locations on the main board, and in reverse turn order choose a round booster for the first round. The first player begins.